PITTSBURGH (AP) Joe Musgrove’s fine work on the mound was overshadowed by his aggressiveness on the bases. 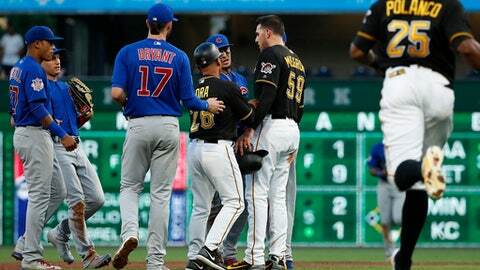 Musgrove pitched seven strong innings and his hard slide led to both teams emptying their benches in another tense moment in the series between NL Central rivals, leading the Pittsburgh Pirates to a 2-1 victory over the Chicago Cubs on Wednesday night. Musgrove (2-0) helped end the Pirates’ four-game losing streak by overcoming a shaky first inning to allow one run on seven hits and four walks. He also had five strikeouts, five days after pitching seven scoreless innings against the St. Louis Cardinals to win his Pirates debut. Baez said after the game that he was not upset, and Chicago manager Joe Maddon used the word ”frivolity” to describe the incident. ”I wasn’t trying to get caught in proving anything because I was on a new team, but it does feel good to contribute right away,” Musgrove said. Musgrove outpitched Kyle Hendricks (4-4), who surrendered two runs and seven hits in five innings while striking out one and walking one. The Cubs’ three-game winning streak was snapped. Cubs: RHP Yu Darvish was found to have inflammation in his right triceps but no structural damage after undergoing an MRI. Signed to a $126-million, six-year contract in February as a free agent, Darvish last pitched May 20. … RHP Carl Edwards Jr. (right shoulder inflammation) was placed on the 10-day disabled list and RHP Cory Mazzoni was recalled from Triple-A Iowa. Edwards felt pain after pitching one scoreless inning in Tuesday night’s win over the Pirates. Mazzoni got two outs in a scoreless inning. Pirates: C Francisco Cervelli returned to the lineup after missing three games with flu-like symptoms and was 0 for 4. … RHP Ivan Nova (sprained right ring finger) will miss his second straight start Sunday at St. Louis and either pitch a simulated game or make a minor league rehab start before being activated from the DL. … LHP Enny Romero (left shoulder impingement) has started throwing off the slope of the mound at extended spring training in Bradenton, Florida.